Louisville, Ky. – Celebrating its 116th year, the World’s Championship Horse Show was held at the Kentucky State Fair’s famed Freedom Hall in Louisville, Ky., from August 18-25. With premiums totaling over $1 million, the World’s Championship Horse Show is the crown jewel of competitions for the American Saddlebred, Roadster, Hackney, and the saddle seat equitation discipline. More than 2,000 horses and ponies competed for the coveted trip down Freedom Hall’s victory lane, and exhibitors from seven to 80 years-old enjoyed every moment with their equines at the show. Learn more about the breeds and divisions represented. The show’s exhilarating finale, Finals Night, did not disappoint the enthusiastic crowd that filled Freedom Hall. Seven combinations were named 2018 World’s Grand Champion in the Harness Pony, Roadster to Bike, Fine Harness, Roadster Pony, Hackney Pony, and the highly anticipated Three-Gaited and Five-Gaited World’s Grand Championships. No stranger to the winner’s circle in equestrian competition in multiple disciplines, Misdee Wrigley Miller (Lakewood Ranch, Fla.) kicked off the night by winning the Ladies Three-Gaited World’s Championship title with HS Baby Steps, Hillcroft Farm’s nine-year-old American Saddlebred mare, for the fourth year in a row. James and Misdee Wrigley Miller’s Hillcroft Farm had an incredible week, accumulating 10 wins at the World’s Championship Horse Show, including Live Action, a 16-year-old Standardbred gelding, who was crowned the World’s Grand Champion Roadster Horse with trainer Larry Hodge (Springfield, Ky.) driving. The Fine Harness World’s Grand Champion was Madeira’s Code Red, High Spirits Farm and Anna Marie Knipp’s six-year-old American Saddlebred gelding, wearing the white roses with trainer James Lowry (Ashland, Mo.) driving. Notable horseman and author Smith Lilly (Princeton, W.V.) 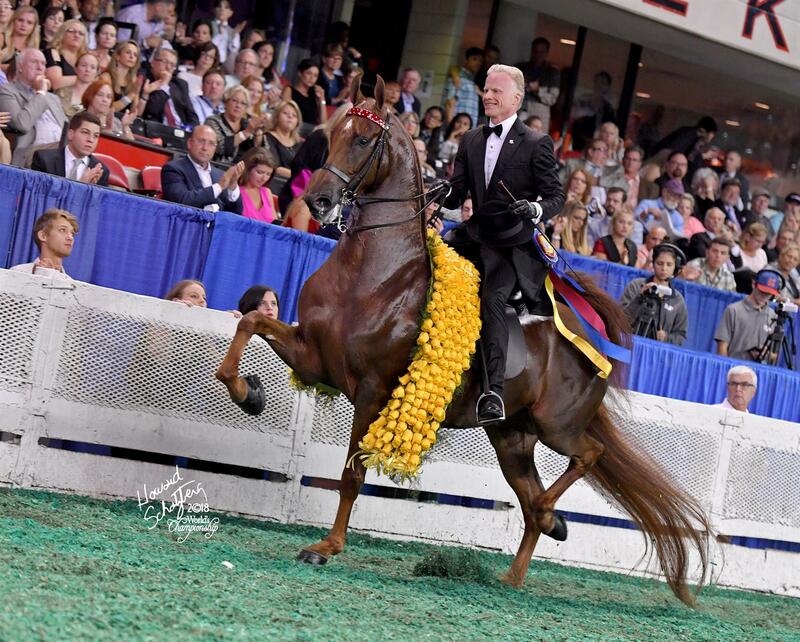 won the Three-Gaited World’s Grand Championship aboard Tango’s Token Kiss, Grace Arnold’s six-year-old American Saddlebred stallion, for the second consecutive year. The combination also earned the title in 2015. The evening wrapped up with the Five-Gaited World’s Grand Championship, which is considered the pinnacle of American Saddlebred competition. Daniel Lockhart (Springfield, Ky.) rode CHThe Daily Lottery, Misdee Wrigley Miller’s 14-year-old American Saddlebred gelding, to the win and coveted title as the World’s Grand Champion for the second time. This grand horse has also won the World Champion Amateur Five-Gaited title three times and the Junior Exhibitor World Five-Gaited Championship twice. Visit the Learning Center to learn more about the American Saddlebred with Smith Lilly in this video and all of US Equestrian’s 29 recognized breeds and disciplines, including the Roadster, Hackney, and saddle seat equitation here. Join the conversation and follow US Equestrian on Facebook, Twitter, and Instagram. Use #JoinTheJoy.